Christian believers in Jesus Christ are often referred to as pilgrims, not necessarily because we are physically embarking upon a literal journey to a distant land—although we may be—but rather because we perceive the temporary qualities of this earthly life and see on the horizon a home with the Living God. We are just passing through this life. Speaking about some of the most faithful followers, the author of Hebrews says, “All these people were still living by faith when they died. They did not receive the things promised; they only saw them and welcomed them from a distance, admitting that they were foreigners and strangers on earth. People who say such things show that they are looking for a country of their own. If they had been thinking of the country they had left, they would have had opportunity to return. Instead, they were longing for a better country—a heavenly one. Therefore God is not ashamed to be called their God, for he has prepared a city for them” (Hebrews 11:13-16). In the moment that we are born again, we begin a hand-in-hand journey with God through His Holy Spirit who lives inside of us. It is a journey during which He reveals the power and sufficiency of His hand, the mercy and passion of His heart and the holiness of His divine countenance time and time again as we trust our lives to His promises. Of course, there is not a point on earth when one can ever say, “I’ve achieved spiritual perfection! There is no more growth for me because I’ve reached the top of it all!” On the contrary, we continue on as Paul advised us saying, “Not that I have already obtained all this, or have already arrived at my goal, but I press on to take hold of that for which Christ Jesus took hold of me. Brothers and sisters, I do not consider myself yet to have taken hold of it. But one thing I do: Forgetting what is behind and straining toward what is ahead, I press on toward the goal to win the prize for which God has called me heavenward in Christ Jesus” (Philippians 3:12-14). So I climbed for a while by grabbing tree limbs which would jut out from the ground. In this way, I was able to go a considerable distance, but in the end decided that it might be easier—and quicker—if I climbed up the track of a waterfall that had turned into little more than a trickle in the dry weather. Straining and stretching, I was able to go much more efficiently in the direction I wanted to go. I occasionally thought of abandoning my new direction, especially after disturbing a slimy orange salamander which blinked at me with as much surprise in its eyes as was in my own. 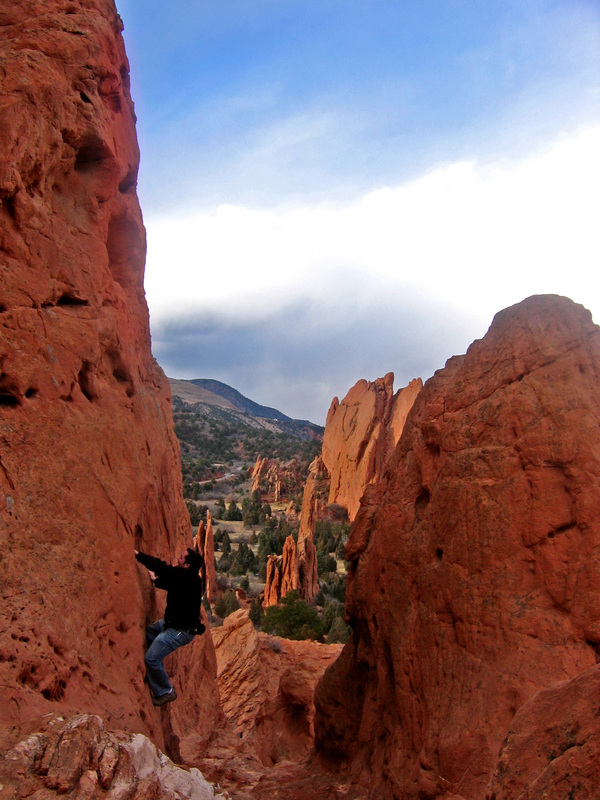 When I finally neared the top, the grade dramatically leveled out and I was able to stand up straight on my feet. My brothers were waiting at the top when I turned and looked down the hill I had just climbed. “Okay, maybe it wasn’t easier or faster but it was more interesting,” I told myself. I faced forward to take the last few steps to the top… only to have a large flat stone under me shift sharply, throwing me backwards. I suddenly found myself flipping backwards out of control. I tried to yell, but I don’t think it sounded very intelligible. “A-i-e-e-umph!… Umph!… Umph!… Umph!” I rolled steadily for a few yards, dropped five or six feet, rolled some more and then fell another couple of yards. The farther I went the more the slope decreased, but I still could not stop myself. Vaguely aware that I was quickly approaching a sheer plummet of 15 feet or so, I tried desperately to grab a tree or bush as I went spiraling by, but I wasn’t able to grip anything. As it became clear to me that I was definitely going off the edge, I prayed, “Lord, please don’t let there be any jagged rocks or sharp sticks down there!” Obviously, I didn’t have time to be terribly eloquent or thorough in my prayer, but that’s one of the wonderful things about prayer: it doesn’t have to impress anybody because the only real audience is God. I abruptly felt myself launching out into the air and then landing with a crunching sound in a large mound of leaves that had evidently piled up in the grotto shadowed under the lip of rock from which I had just jettisoned. I lay there for a long moment noting the sensation of not having any air in my lungs since I could not quite remember how to breathe. Finally, when the sweet air decided to return to my body, I was able to stiffly crawl out of the leaves. My brothers’ voices floated down to me asking me if I was all right. I still hadn’t collected my senses quite enough to answer them but they were soon with me and could see that I wasn’t really hurt. In hindsight, the experience taught me several things. First, we should never get too sure of ourselves until we completely reach our goal. Secondly, God can guide a trusting heart safely through a fall so that one may climb once again. Lastly, as we continue to press onward and upward in our walk with God, our circumstances could shift suddenly and our lives may seem as if they are rolling out of control. Sometimes this happens when we feel closest to God. But rather than becoming angry with God for pulling the rug out from under our feet, let us thank Him for His ongoing faithfulness, which is proven through hardship, not by the absence of it. Indeed, when our Father has opened to us His grace and mercy as well as His awesome power, we may find strange and unexpected turnings in our circumstances that will deepen the working of His grace in our lives if we’ll allow Him to have His way with us. It’s God’s path to humility we are to travel. As Paul put it, “Therefore, in order to keep me from becoming conceited, I was given a thorn in my flesh, a messenger of Satan, to torment me. Three times I pleaded with the Lord to take it away from me. But he said to me, ‘My grace is sufficient for you, for my power is made perfect in weakness.’ Therefore I will boast all the more gladly about my weaknesses, so that Christ’s power may rest on me. That is why, for Christ’s sake, I delight in weaknesses, in insults, in hardships, in persecutions, in difficulties. For when I am weak, then I am strong” (2 Corinthians 12:7-10). Previous Sept/Oct Single! is Out!